EDR.. explosion-proof motors bring safety and performance to your system: whether according to ATEX, IECEx or HazLoc-NA®. The EDR.. motor series features 13 sizes and can be used in environments with explosive air/gas mixtures and/or air/dust mixtures. You can rely on our drive technology, even in potentially explosive atmospheres. There is no need to make any compromises either in terms of safety for your application or in terms of the variety of performance levels of the drives used. 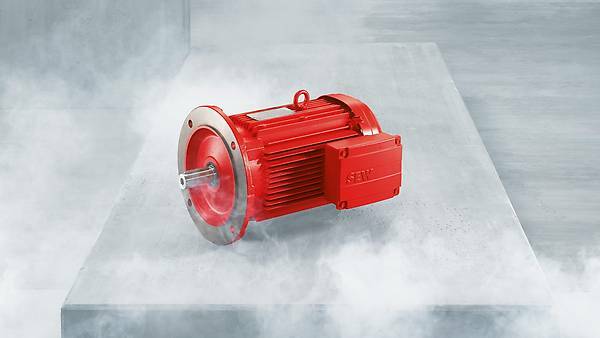 This is because our explosion-proof AC motors from the EDR.. series comply with the most important international standards and directives. They meet all requirements for tools and fixtures intended for use in potentially explosive atmospheres as defined in EU Directive 94/9/EC (ATEX), or as of April 20, 2016 of the EU Directive 2014/34/EU (ATEX). They are also available with different protection types or IP degrees of protection depending on the atmosphere, i.e. gas or dust. In terms of their safety requirements, motors from the EDR.. series comply with equipment group II. In simple terms: You can use these explosion-proof motors in categories 2 and 3, in gas zones 1 and 2, and in dust zones 21 and 22. Directive 2014/34/EC has been applicable since February 26, 2014 for devices and protective systems for designated use in potentially explosive atmospheres. This directive replaced directive 94/9/EG. Declarations of conformity according to the new directive cannot be issued until April 20, 2016. The motors are available with IECEx certification according to EPL b and c (Equipment Protection Level) for countries that recognize IECEx regulations. HazLoc-NA® motors comply with the Class Division System and are certified by CSA for use in Division 2 Class I (gas) and Class II (dust). The motors come in 14 sizes from 63 to 315 which cover a power range from 0.12 kW up to 175 kW (50 Hz) or 200 kW (60 Hz), ensuring varied levels of performance. We thus enable you to avail of countless drive combinations for the most diverse systems and machines in potentially explosive atmospheres. Only half the solution without a gear unit? Then use our modular system and combine an explosion-proof motor with a helical, parallel shaft, worm, bevel or SPIROPLAN® gear unit of your choice. Also for servo applications, the range also includes a suitable planetary gear unit or helical-bevel gear unit. whether in a gas or dust atmosphere, you can reliably operate our explosion-proof motors in both hazard zones. thanks to their approval according to EU Directive 2014/34/EU (ATEX) the motors can be used all over the world. As a system operator, special guidelines apply for areas with explosive gas/air and dust/air mixtures. We naturally observe these guidelines when newly developing or improving explosion-proof drive technology. Put your trust in our many years of experience and expertise! EDR.. series motors comply with the most important standards and meet the IEC 60034 motor standard. /3D and /3GD /3Gc and /3GDc II3G, EPL Gc, T3, "nA"
It is important to observe and comply with guidelines particularly in areas containing potentially-explosive gas/air and dust/air mixtures. Thanks to many years of experience and expertise in this area, we guarantee that the relevant guidelines are observed. Furthermore, the company’s expertise is continually being expanded to include new and further developments. Add-on encoder EDR71-132 /ES7S, /ES7R, /ES7C, /AS7W, /AS7Y, /EV7., /AV7. Add-on encoder EDR160-280 /EG7S, /EG7R, /EG7C, /AG7W, /AG7Y, /EV7., /AV7. in potentially explosive atmospheres with air/gas or air/dust mixtures according to Directive 94/9/EC (ATEX), or as of April 20, 2016 of the EU Directive 2014/34/EU (ATEX) and in accordance with HazLoc-NA®.